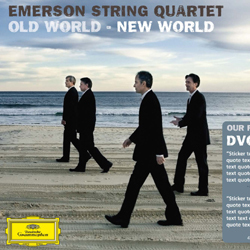 Fresh off its ninth Grammy win for last year's album Intimate Letters, the Emerson String Quartet releases Old World-New World for Deutsche Grammophon on Tuesday, April 13, 2010. Old World-New World realizes the ensemble's longtime aspiration to record a retrospective of its most beloved Dvorák works. This three-disc set features the premiere recording of each of these works by the Emerson String Quartet: Disc I features Dvorák's middle Quartets, Nos. 10 and 11; the programmatic "American" Quintet with Paul Neubauer and 12-song-cycle Cypresses comprise Disc II; and the final disc culminates in the composer's last two quartets, Nos. 13 and 14.